It’s Lively’s gift, though, to make each of these people of genuine interest to us. There are no cataclysms, no dramatic show-downs, no epiphanies in How It All Began, but by the end of the novel very little is quite the same in anyone’s life, all because of the sequence of disruptions begun with the mugging. Charlotte’s injury causes Rose to stay away from work for a while, so her employer, historian Sir Henry Peters, calls on his daughter Marion, thus precipitating a last-minute text message to Marion’s married lover Jeremy, which is intercepted by Jeremy’s wife Stella — and thus “the Daltons’ marriage broke up because Charlotte Rainsford was mugged.” Marion, unaccustomed to tending to Sir Henry’s business, forgets his notes when they head to an event at the University of Manchester; as a result, his speech is a disaster, which leads Henry into various machinations designed to revivify his moribund career and recover some wished-for celebrity. In Manchester, Marion meets a man she hopes will help turn around her struggling interior design business; though her involvement with him doesn’t lead to financial prosperity (little does, in this age of recession and belt-tightening), it turns out nonetheless to be a fortuitous encounter. You live twenty years in a London suburb. Husband, children, house, cat — go to the supermarket. Then — something happens. A person happens, that’s all. Him. You do not mess up everything that has been important to you for most of your life because you are in love with an Eastern European immigrant you have known for ten weeks. You do not do that to Gerry. To Lucy and James [their children]. These have been the stories: of Charlotte, of Rose and Gerry, of Anton, of Jeremy and Stella, of Marion, of Henry, Mark, all of them. The stories so capriciously triggered because something happened to Charlotte in the street one day. But of course this is not the end of the story, the stories. An ending is an artificial device . . . but time does not end, and stories march in step with time. Equally, chaos theory does not assume an ending; the ripple effect goes on, and on. These stories do not end, but they spin away from one another, each on its own course. Ah, old age. The twilight years — that delicate phrase. Twilight my foot — roaring dawn of a new life, more like, the one you didn’t know about. We all avert our eyes, and then — wham! you’re in there too, wondering how the hell this can have happened, and maybe it is an early circle of hell and here come the gleeful devils with their pitchforks, stabbing and prodding. 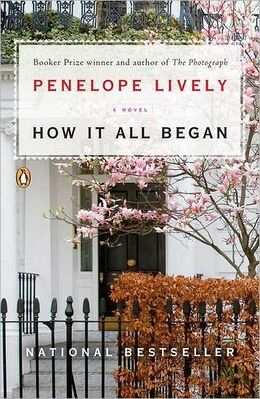 Though there’s nothing strikingly memorable or original about How It All Began, what it does, it does very nicely: it seems true, both to its characters and to what we know or feel about the tragicomedy and uncertainty of our lives.